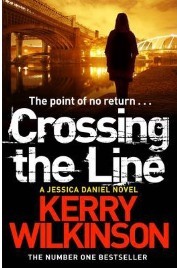 Released earlier this month, Crossing the Line is the eighth novel in Kerry Wilkinson’s Jessica Daniel series. I haven’t read any of the previous novels, but this one is intriguingly pitched as the start of “season 2”, a place where the plot arc allows new readers to more easily jump on board without feeling lost. For me this worked well; characters were introduced smoothly and gradually, while past events were referred to where necessary without ever feeling you were in the middle of an info-dump aimed at new readers. I had no problems picking this up as a newcomer, and indeed liked it enough to make me want to investigate some of the previous seven books featuring Jessica. It does make me wish that some other long-running novel series would think in terms of “seasons” to help bring new readers into their books without first trawling through an intimidating amount of back story, though. Jessica is a newly-promoted Detective Inspector in the Greater Manchester Police, struggling to cope with the demands of her new post while being a sergeant down (as her boss still hasn’t replaced her), half-frozen in the coldest spring on record, and facing a big local anniversary. Twenty five years ago, the city was in the midst of a reign of terror by the “Stretford Slasher”, a Yorkshire Ripper-type bogeyman who murdered multiple women before being caught by Niall Hambleton, a now-retired copper who still hangs around the station to lend his experience to resolving the backlog of GMP’s cold cases. Niall is viewed as something of a hero to the force, yet when Jessica talks with him he seems oddly reluctant to discuss the case that was the making of his career. But with media interest in the local force on a high, they are made to look incompetent during a visit to the city by the Home Secretary, when a masked man in a hoody carries out an acid attack on watching local councillor Luke Callaghan. Jessica witnesses the attack and gives chase, but the man manages to escape through a maze of back streets. To make matters worse, the CCTV images they pull from public transport are worse than useless, leaving them groping in the dark for the perpetrator of this viscous crime. If that isn’t enough, just days later there is a second attack, this time a landlord beaten with a sawn-off baseball bat by a man matching the first attacker’s description and wearing the same mask. The only thing connecting the two men seems to be that they were unpleasant characters, leaving Jessica to fear that an anarchist is loose in the city, committing random attacks on the public. But with memories of the Slasher refusing to die down and her caseload stacking up, what will Jessica need to do to in the line of duty? The plot, while not startlingly original, is tight and fast-paced, and I was willing to overlook the slightly more far-fetched elements that seem to be par for the course in crime novels these days. The characters are realistic but not overly memorable (although I did come to rather like Jessica), and the city is used to good effect as a backdrop; this story has a good sense of place, and couldn’t be set anywhere other than Manchester. What raised the novel above the standard of your usual police procedural for me was the quality of the writing, however, which took on a wonderfully dark comic tone. As a fan of black humour, it was this aspect more than any that made me interested in reading some of Jessica’s earlier adventures. The ending of the book clearly feeds into the next in the series, so I may well keep an eye open for that when it appears in the new year. Recommended to crime fiction fans. With thanks to Pan Books for providing me with the review copy. No Comments on "Crossing the Line"